Democrat Jay Inslee has won the Washington state governor’s race, NBC News projected Friday night. Republican Rob McKenna called Inslee shortly before 6 p.m. Pacific Time to concede the race and congratulate the governor-elect on winning, Randy Pepple, McKenna’s campaign manager told reporters, the Seattle Times reported. With the Washington race conceded, Democrats won seven out of 11 governor races this year. 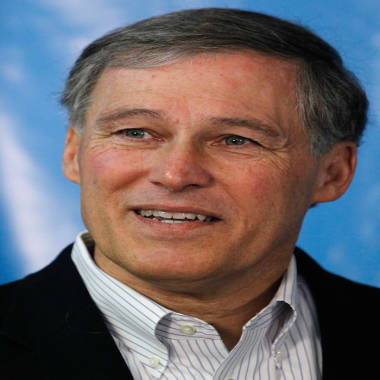 Inslee thanked McKenna, Washington’s attorney general, for what he described as a gracious conversation, The Associated Press reported. Inslee was a U.S. representative but resigned last March to focus on running for the governor’s seat. The decision brings to end one of the most-watched, most-expensive gubernatorial races in the country. The two candidates and outside political groups raised and spent some $40 million in the race. Inslee's campaign was built largely around his plans to spur job growth by investing in clean energy and other specific sectors. Both candidates vowed to not raise taxes, but in January lawmakers will begin negotiations over how to deal with a budget shortfall and the need for more education funding. Inslee has already started the process of forming a team that will help him transition to office, AP reported. Inslee had steadily held a 51 percent advantage in the race as ballots were counted this week. Republicans last won a Washington governor's race in 1980, when John Spellman was elected.